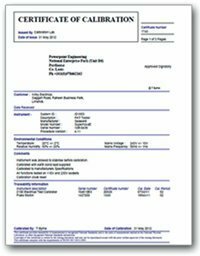 When you choose Powerpoint Engineering to handle the calibration of your electrical testing equipment, you will receive a complete Certificate of Calibration for every item that we calibrate for you. Our Certificates of Calibration provide traceable verification that your equipment is tested in accordance with national and international standards. Powerpoint Engineering Ltd has been assessed by the National Standards Authority of Ireland (NSAI), and complies with the provisions of the standard Quality Management System I.S. EN ISO 9001:2008. In addition to this, all of our calibrations are carried out in accordance with Measurement Management Standard ISO 10012:2013. All of our calibrations are carried out in accordance with Measurement Management System I.S. EN ISO 10012:2013. For further information, email us or call us on 057 866 2162, we would be happy to assist with any queries you might have.